We provide comprehensive and globally renowned solutions for your electronic systems. For the design and production of circuit breakers for equipment protection, we provide superior services, unmatched throughout the field. With our impressive range of circuit protection products, we provide unrivalled solutions for your safety. All possible application requirements are covered, and with E-T-A, you can rest assured you will receive the highest-quality circuit protection products, designed and manufactured with skill and dedication. Supported by our international network of subsidiary companies and representatives, we design custom solutions for specific applications. We always stay in close proximity to our customers at all times; ensuring exact requirements are met on time, all of the time and at the right price. If you are looking for overcurrent circuit breakers, we provide the complete solutions. With all application requirements covered, the range includes thermal overcurrent circuit breakers, thermal-magnetic overcurrent circuit breakers, hydraulic-magnetic and magnetic overcurrent circuit breakers and high performance circuit breakers. Our vast product range also extends to electronic overcurrent protection, suited to the protection of equipment components in industrial applications and supply lines. To prevent short-term voltage dips of switch-mode power supplies, our electronic overcurrent protection products provide the most reliable solutions. Each with their individual benefits, our electronic overcurrent protection products have the capabilities to provide selective protection or disconnection even at very unfavourable overload conditions. Further features of the range include current-limited switch-on of loads with high input capacities without increasing the current ratings as well as failure signalling. Visit our website to view the full range, where you will find in-depth information on each individual product. You can also use our ‘product comparison’ feature to ensure you find exactly what you are looking for. Within our extensive range of circuit protection devices, we provide many differing solutions for short circuit protection. Our thermal overcurrent circuit breakers are ideally suited to protect against the short circuits, low level overloads that often occur in many types of equipment and systems, ranging from motors and transformer windings, through printed circuit boards, to the low voltage power distribution circuits of road vehicles, boats and battery powered machines. Our thermal-magnetic overcurrent circuit breakers also provide short circuit protection. These products provide protection for equipment in telecommunications, process control and other industrial applications where complex equipment requires a high precision performance. For more information on these products or any of our other short circuit protection products, visit our website. If you require explosion proof, ATEX approved circuit breakers; our ESX10 and ESX10-T electronic circuit breakers have approval to IEC/EN 60079-0 general requirements and IEC/EN 60079-15 ignition protection class »n«. A special ATEX version for Ex zone 2, our electronic circuit protectors type ESX10 (pluggable onto power distribution system Module 17plus) and ESX10-T (for rail mounting), are particularly intended for applications in process control in the chemical, petroleum and gas industry. The space-saving design of the ESX10-T is available for DC 12 V or DC 24 V applications and offers the best possible protection of loads (controls, sensors, transformers, solenoid valves etc. ), which are fed by switch-mode power supplies or battery-buffered power supplies. Additional Ex approvals such as UL 1604 Class I Div 2 and CSA 22.2, No: 213 as well as the approval for industrial applications to UL 508 and UL 2367 make the ESX10 products fit for global use in the process control industry. We provide the most comprehensive range of products for circuit protection in every industrial application. We also specialise in delivering unrivalled power management solutions. If you require power distribution systems, our numerous options in power distribution modules are extensive. Our power distribution systems range from the 17plus track mountable modular power distribution system to the X8340-SZ4 (4-way module), a power distribution system with modules side-by-side for hydraulic-magnetic circuit breaker type 8340-F.
Our power distribution modules are suited to power distribution in telecommunication systems; industrial switching and control systems for the oil, gas and chemical industries; and power engineering and environmental engineering. Visit our website to choose from the full range where each product offers a full, detailed description. To ensure you make the right choice, try our ‘product comparison‘ feature which allows you to compare features and technical data within the product groups. Our power management solutions include comprehensive and superior options in DIN rail mount power distribution systems. Our state-of-the-art DIN rail mount power distribution systems are particularly suited to the design of power distribution units, e.g. in a control cabinet, where circuit breakers or protectors are connected to a common entry line and protect individual loads and supply lines against overcurrent and short circuit. Mechanical elements required for the design as well as electrical wiring are included in the power distribution system. We provide unrivalled cabinet system solutions with our superior options in circuit protection cabinet systems. Our circuit protection cabinet systems include the SBG-T control cabinets. These cabinets allow for compact and well-structured power distribution. Our cabinet systems are suitable for power distribution in industrial switching and control systems in industries such as chemical, oil and gas; power engineering; environmental engineering; and telecommunications. For electro-mechanical switching protection, we provide comprehensive and customised solutions. We specialise in the quality design and manufacture of a wide range of electro-mechanical switching protection products. 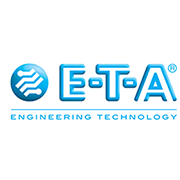 E-T-A designs and manufactures a broad range of electro-mechanical switching protection products and electronic products for circuit protection, control and instrumentation. This includes the world’s largest range of circuit breakers for equipment (CBEs). Our customised service involves designing solutions in conjunction with you and building them fully interconnected to an agreed schedule. We supply a comprehensive, diverse and state-of-the-art selection of DC 24 V power distribution systems. Ranging from the Module 17plus power distribution systems to the SVS02 AND SVS04 power distribution systems, our DC 24 V power distribution solutions will cover any requirement or preference you have. Our DC 24 V power distribution systems are heavily relied upon in the plant engineering and construction industries. You will find extensive information on DC 24 V power distribution on our website, where you also have the option of downloading a detailed brochure. For smart power relays, we offer numerous options, all with their individual and state-of-the-art benefits. The E-1048-8C smart power relays are remotely controlled electronic load disconnecting relays. They have three functions in a single unit: electronic relay, electronic overcurrent protection and status indication. The 7 pin CUBIC version is designed for use with standard automotive relay sockets. A choice of current ratings is available. We also provide the smart power relay E-1048.8S. – A remotely controllable electronic load disconnecting relay with two functions in a single unit: electronic relay and electronic overcurrent protection. A choice of current ratings is also available with this model. For comprehensive power management solutions, we provide everything from design to delivery. Our power management solutions include solid state remote power controllers (SSRPC). Products include the type E-1048-S6xx, an opto decoupled transistorised switching device providing both protection and signalisation. It is used wherever safe switching and protection of resistive, inductive or lamp loads in DC voltage systems is required. We also provide the E-1048-7.. solid state remote power controller. This solid state remote power controller is a transistorised switching device providing both protection and signalisation. It is suitable for all applications where the capabilities of the existing PLC outputs are not sufficient or where no protection against overload and short circuit or wire breakage monitoring of connected loads is provided. For more information on our solid state remote power controllers, visit our website. We work closely with companies from the chemical and petrochemical industry and provide a variety of components and complete solutions. Our products, which include power D-box systems, are reliable, they are designed and manufactured to the highest quality levels and they provide consistent performance, integral requirements for any business operating in the chemical, oil and gas industry. Our power D-box systems are highly modular power distribution units, available in the various differing configurations such as PCB, wiring and high power D-box. The complete range is characterised by: low-cost and easy to install connections, serviceability and high availability. To find out more about our power D-box systems, including detailed product information and technical data, visit our website. For the chemical, oil and gas industries, we specialise in solutions for power distribution modules. Our power distribution modules are also perfectly suited for power distribution in telecommunication systems (mobile radio, internet, access, transmission and switching technology), power engineering and environmental engineering, among other industries. To allow individual design, a highly modular system is hidden behind our power distribution modules. They are available as track-mountable versions, Euro-card versions or crossbar versions. The entire power distribution modules range features a cost-efficient (industrially manufactured) user-friendly termination technology. It also boasts service friendliness and high availability. Products range from power distribution systems for hydraulic-magnetic circuit breaker type 8345, to power distribution systems with modules side-by-side for hydraulic-magnetic circuit breaker type 8340-F. To see the full range, visit our website. For circuit protection switches offering maximum versatility we provide combined switch and circuit breaker products such as the type 31030. With circuit protection switches like the type 3130, there are fewer components, less wiring and attractive styling. These are just some of the benefits offered by the switch circuit breaker combination. Our circuit protection switches are available in a range of colours and technical specifications. This ensures the switch/circuit breaker provides the ideal solution for complex high-end application requirements. If you are looking for digital switching systems, then PowerPlex® - the intelligent bus system for the protection and control of electrical, is the ultimate choice. The PowerPlex digital switching system features proven CAN-technology as well as the Multiplexing technique, allowing for easy configuration. Our PowerPlex digital switching systems benefit from a touch screen display, built-in diagnostics, monitoring and redundant mechanisms, and programmable overload protection. Typical applications of the PowerPlex include de-centralised, individually configurable power distribution and control system for vehicles such as boats. PowerPlex consists of a number of modules distributed on the boat to connect loads, switches, sensors. Models include the PP-M-PM024 (PowerPlex panel module) and the PP-M-DC024 (PowerPlex power module). Our vast options in circuit protection devices include high-performance circuit breakers and battery isolation switches. Our battery isolation switches are ideally suited for installation in the main battery systems of heavy duty vehicles such as tankers, boats, off-road plant and various other battery powered equipment. Like our high-performance circuit breakers, our battery isolation switches are based on a thermal-magnetic trip mechanism. The thermal part of the circuit breaker provides delayed protection in the event of overload. The magnetic part disconnects the faulty circuit in the event of overload or short circuit within milliseconds. Visit our website to see the complete range. Setting the highest standards regarding safety, the aerospace industry demands products and technology of the highest grade. We consistently provide renowned, sophisticated aircraft circuit breakers to protect cables and loads in all types of aircraft. Included in our range of superior aerospace circuit breakers are many options in high performance circuit breakers. Many differing options are available and when you visit our website you can use our ‘product comparison’ feature to ensure you choose the exact product you are looking for. Whether it is a thermal circuit breaker with threadneck mounting and push-pull actuation, or a single pole aircraft simulator switch with miniaturised design and threadneck mounting, you are sure to find what you are looking for. We only offer the most advanced, versatile and reliable products and our impressive range of high performance circuit breakers holds testament to this guarantee. We offer unrivalled dedication, knowledge and experience in providing solutions for aerospace companies throughout the world. Whether you require standard parts, customer-specific products or custom designed power distribution systems, we offer a wide range of solutions and ensure the highest levels of protection while at the same time reducing the weight and cost of your design. For the aerospace industry, our circuit breakers range includes thermal overcurrent circuit breakers. We offer a plug-in type single pole thermal circuit breaker with an optional switching function, and a thermal circuit breaker with push-push actuation for threadneck panel mounting. For more information on our options in thermal circuit breakers for the aerospace industry, visit our website. We provide comprehensive and market superior products such as circuit breakers and power management systems for the pharmaceutical and food industries. If you are looking for reliable and selective protection of AC and DC control circuits for fully automated and remotely controlled production processes, we have the complete solutions for you. We offer customised protection in a compact design, perfectly wired with flexible power distribution systems. Our solutions for the pharmaceutical and food industries include numerous options in thermal-magnetic circuit breakers. No matter what you requirement may be, our thermal-magnetic circuit breakers range is sure to accommodate. Products range from small width thermal-magnetic circuit breakers with slide actuator and plug-in mounting, to rail mounting toggle actuator with an auxiliary contact option. As well as thermal-magnetic circuit breakers, we also supply numerous other products within the magnetic circuit breakers range suited to pharmaceutical applications. Our magnetic circuit breakers and other products for the pharmaceutical and food production industries provide professional solutions for process plants on dosing, weighing and mixing equipment as well as integrated delivery systems and modular packaging machines. We work directly for the pharmaceutical and food production industries provide professional solutions for process plants on dosing, weighing and mixing equipment as well as integrated delivery systems and modular packaging machines. For more information on any of our magnetic circuit breakers or any other related product or solution, please visit our website. Within the renewable energy field, accurate overcurrent protection and integral error signalling are increasingly important as investments in the production of renewable energy continually increase. Here at E-T-A we provide unrivalled solutions and state-of-the-art products to aid the progression and protection of these new technologies. Our dependable solutions include DC disconnect switches, firefighter switches, hydraulic-magnetic circuit breakers, isolators, power distribution systems, electronic relays and emergency switches. Our hydraulic magnetic circuit breakers for renewable energy applications include the type 8345 toggle-operated hydraulic-magnetic circuit breaker. This circuit breaker is flange mounted and has ratings up to 125A. For the reliable protection and control of electrical installations, we provide PowerPlex® bus systems. Our state-of-the-art and technologically advanced PowerPlex bus systems feature proven CAN-Technology and the Multiplexing technique allowing for easy configuration. The power distribution system also features a touch screen display with built-in diagnostics, monitoring and redundant mechanisms and programmable overload protection. The E-T-A PowerPlex bus systems are for de-centralised, individually configurable power distribution. Two models are available: the PP-M-PM024 PowerPlex panel module and the PP-M-DC024 PowerPlex power module. For more information on the E-T-A PowerPlex bus systems, visit our website.